A study conducted by a former Florida Sea Grant Guy Harvey scholar and fellow provides new evidence that red grouper, already a species of considerable economic importance to Florida fisheries, can also help lessen the negative effects of invasive lionfish on reef fish communities. According to the study results published in Marine Ecology Progress Series, the presence of adult red grouper in their favorite hangouts around Florida Bay’s seabed tends to curb a lionfish’s voracious appetite while improving the neighborhood’s richness and diversity of marine life. “These results highlight the importance of having native species around to reduce the impact of lionfish, and not just relying on things like diver removal programs or hoping that something besides humans will learn to like how lionfish taste,” said Robert Ellis, co-author of the study and an associate research scientist with the Florida Fish and Wildlife Conservation Commission. Lionfish, a native of the warm, tropical waters of the Indian and Pacific oceans, have proliferated quickly in the Caribbean, Atlantic Ocean and Gulf of Mexico, taking over reefs and harming native reef fish populations. While fisheries biologists have been studying lionfish removal methods, there has been less understanding about whether the habitats they occupy have begun to adapt. Ellis said his research showed that when red grouper and lionfish were present in the same territory, the lionfish would eat smaller organisms lower down the food chain instead of juvenile finfish. “We think that this diet shift is a result of the red grouper disrupting the predatory behaviors of the lionfish, causing it to switch to more easily caught prey like cleaner shrimp,” Ellis said. Ellis was awarded one of the 2013 Guy Harvey Scholarships to study the relationship between red grouper and the marine community that develops around the solution holes they dig and inhabit. Solution holes provide critical habitat for spiny lobsters, juvenile reef fishes, shrimp and other organisms needing shelter. Scientists have learned that red grouper are both the chief engineer and the top predator of the holes. Grouper excavate the holes by carrying away mouthfuls of sand and debris, or using tail fins to brush dirt off exposed rock. The holes can range from the size of a trash can to a conference room table, and measure between 1 and 3 feet deep. They can also be complex habitats with multiple openings and tunnels connecting different parts of the hole. To conduct the study, Ellis monitored several solution holes, a common geologic depression on the ocean floor where limestone is exposed. In the experiment, Ellis and his co-author Meaghan Faletti, a graduate student at the University of South Florida, set up four types of solution holes: holes with only red grouper, holes with only lionfish, holes with both predators, and holes with neither predator. By the end of the experiment, results showed that the holes with only red grouper had the most native reef fish present. Not surprisingly, the holes with only lionfish had the least amount of reef fish present. However, the holes with both lionfish and red grouper fared almost the same as the holes without lionfish or red grouper. In other words, lionfish did not eat as many reef fish when red grouper were present. 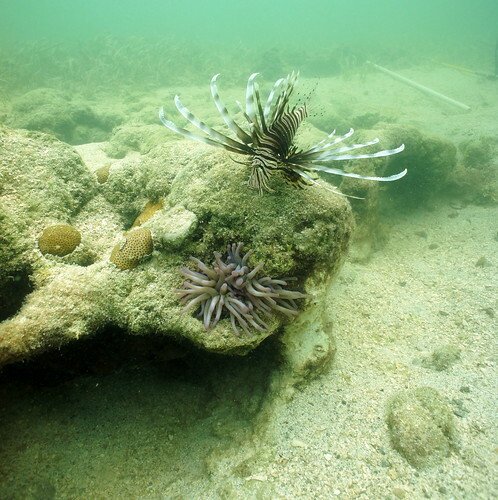 Ellis said the study also provides clues about the important yet unseen roles that native fish play in coral reef communities, as well as the benefits that would be lost if the invasive lionfish were allowed to take over a coastal environment. So, does this mean we should refrain from catching an economically important species like red grouper since they seem to be a weapon in the fight against lionfish? “Unfortunately in the management environment we live in, we don’t really account for benefits like this when it comes to fisheries species,” Ellis said. In addition to the Guy Harvey award, Ellis earned a John A. Knauss Fellowship in 2015, serving on year in Washington, D.C., as the fisheries habitat and ecosystem science coordinator in NOAA Fisheries’ office of science and technology.